Porfirio Gutierrez is an extraordinary weaver who combines ancient Zapotec traditions with a modern sensibility. 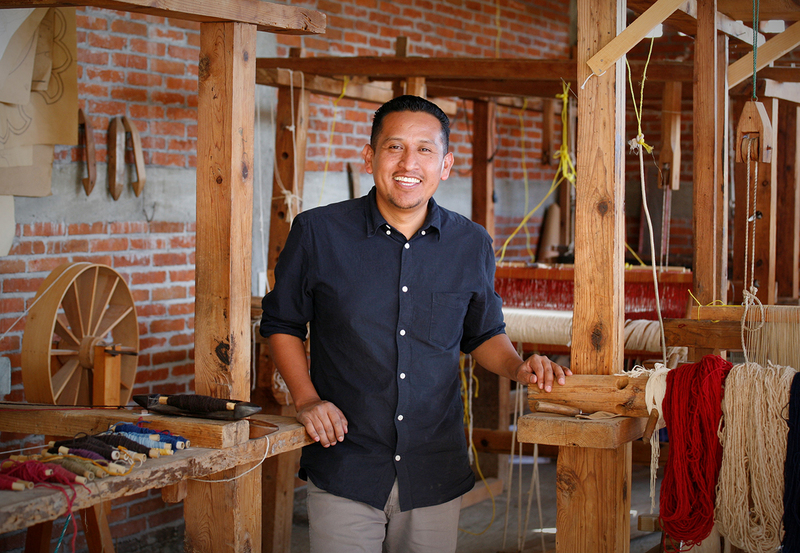 Growing up in Teotitlan del Valle in Oaxaca, Mexico, he was immersed in the ancient art of weaving. Using natural dyes and employing traditional designs, he and his family, it can be said, are making certain that the artistic and spiritual values of his ancestors continue to be known and admired around the world. Porfirio was selected by the Smithsonian Institution’s National Museum of the American Indian to participate in a program documenting the role of indigenous culture in the arts. Porfirio came to the U.S. at the age of 18. He now divides his time between Ventura and his family’s home in Mexico where they are deeply involved in all aspects of Porfirio’s weaving. In 2018, Porfirio was the featured Guest Studio Artist at the Carnegie Museum in Oxnard. He offered classes to the local Mixteco community, ensuring that Oaxacan cultural traditions continue. His talk was sponsored by Michael Rohde. The AfterGlow host was Terry Willison. The FOTM archive has extensive information on this artist.